Daysworth International's top of the range Terminal Tractor to be on show in Brisbane. Daysworth International Highway Legal Ottawa 60T Terminal Tractor. Terminal Tractor pioneers Daysworth International have announced that Australia’s top of the range Highway Legal Ottawa 60T Terminal Tractor will be on display at the Brisbane Truck Show. Powered by the 6.7 litre Cummins ISB Euro 5, the 300HP engine uses Ad Blue and catalytic reduction to meet ADR emissions requirements and is completely road legal. "It is the logical choice for the increasing number of distribution operations with dispersed warehouses and terminals where highway travel is required", says managing director Ivan Vodanovich, adding that the 60T has a GCW of 78 tonnes, and capable of 103km/h. "It is the most important piece of equipment to enter the ‘just-in-time’ supply chain industry for many years. 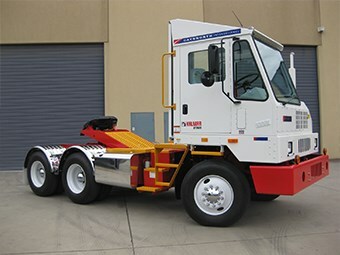 The benefits of a conventional yard truck without the downtime associated with swapping towing vehicles for highway travel". Alongside the road legal tandem drive, Daysworth will also be displaying the newest addition to Followmont Transport’s terminal tractor fleet, the 2015 model Ottawa 4x2, the best selling terminal tractor configuration on the world market, with over 70,000 units sold.